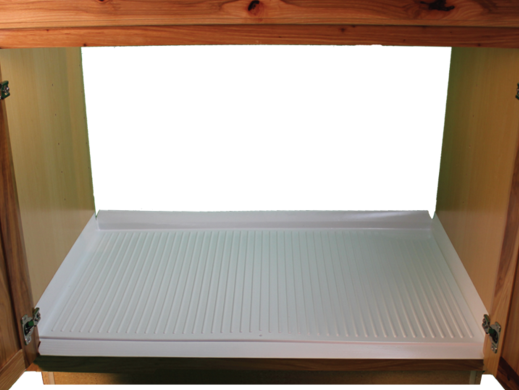 Cabinet Savers are flexible plastic liners designed to protect your kitchen sink cabinets and bathroom vanity baseboards from damage caused by water, leaks, and cleaning chemicals. With a unique channel design and a built in drain cone, they provide warning of leaks, alerting you before potential catastrophe. They are inexpensive and provide a great return on investment. JXT Company has been a Trade Ally of Duke Energy’s The Smart $aver® Rebate Program from the program’s beginning. We sell the energy efficient equipment as well as assist our customers with getting cash rebates from Duke Energy by helping with the application process. 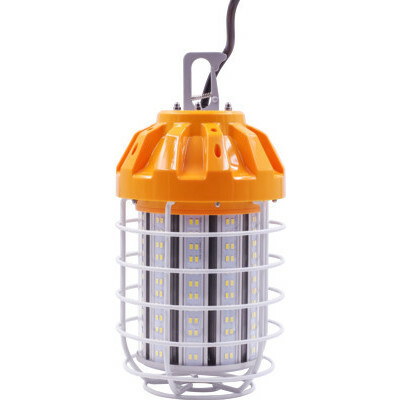 The Smart $aver® Rebate Program is to encourage the purchase and installation of high-efficiency lighting, HVAC systems, commercial and agricultural equipment, as well as equipment for industrial facilities. Rebates paid may vary based on individual equipment applications determined by Duke Energy. 1. Rebates are available for new construction and retrofit of existing and/or replacement of failed equipment. 2. As federal energy policy laws change, equipment efficiency levels may change. 3. Notification of any program changes will be posted on duke-energy.com. 4. Equipment must be installed and operational prior to submitting Prescriptive applications. 5. Prescriptive rebates cannot exceed 75 percent of the customers’ equipment cost. 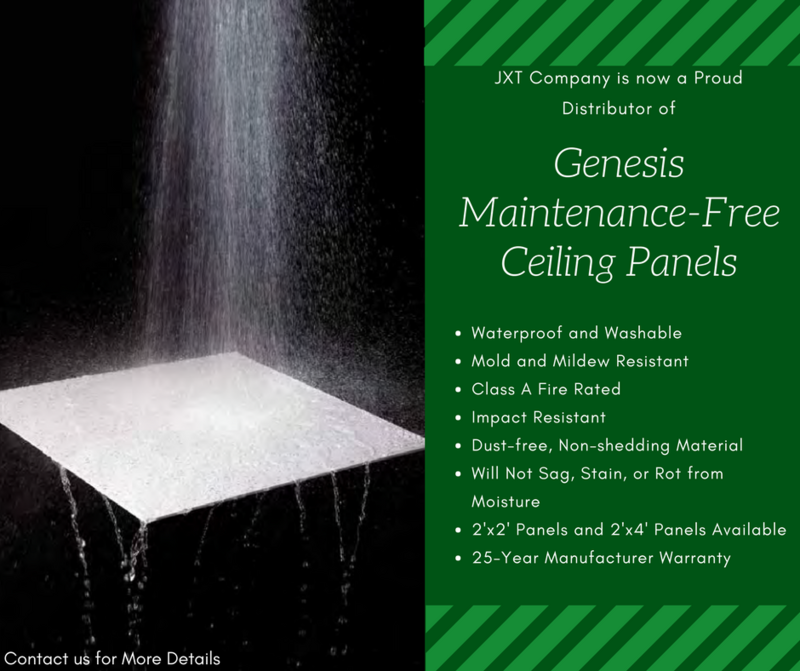 JXT Company is now a distributor of Genesis Maintenance Free Ceiling Panels. For information on specifications or purchasing, please contact us. Sometimes taking on a new task can be frightening. The lack of experience and fear of failure are enough to keep some people from ever accomplishing anything outside of your comfort zone. But don’t let these things hold you back. On the contrary, use your new projects as a way to get more out of life, including skills and lessons that you can apply to other parts of your life. For example, last week I was tasked with a request at work to assemble some screens for one of our clients. There were a lot of thoughts bouncing about, most of them being related to how I had no idea what I was getting myself into. To be honest, I’m not much of a DIY guy, but I also like a good challenge, so I took on the project with some extra gusto and jumped straight in. Screen frames, fiberglass screen, spline, and a utility knife, my tools of the trade. 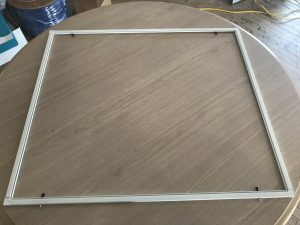 My first order of business was to figure out how I was going to make a screen out of these frames, fiberglass lining, and spline. It’s not rocket science or anything, but for a beginner, it can still be a bit of a challenge to go from piles of material to finished project, so I consulted my trusty companion: the Internet. After watching a very useful video on the subject, I had enough of a grasp on things to get to work. 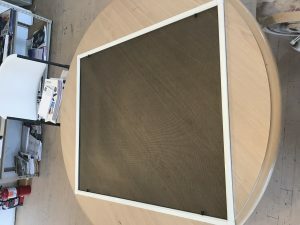 Since the custom screen kits we were using were measured and already had the corner guards and pull tabs built on, I didn’t have to do any cutting or measuring and was able to just snap the frames into place. 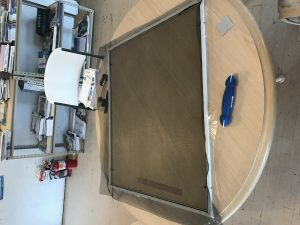 The assembled frame of a screen, ready to be screened and splined. The next step was to cut out a section of screen lining to be laid in the frame. Our kit came with a roll of charcoal fiberglass screen. The important thing to remember for this part was that each side needs to be a few inches longer than the dimensions of the screen, a mistake I overlooked during my first attempt. But to err is human, so I cut out another section of the lining and moved on to the next part of the project. A (mostly) assembled screen and a spline roller. My last major task was perhaps the most daunting of all: rolling the spline over the screen into the frame. Using a spline roller, which is like a glorified double-edged pizza cutter, my objective was to keep the screen in place while also making sure it’s tight. I had to have done this part at least three times before getting the hang of it. A good piece of advice would be to start pulling the screen away from the opposite edge once you reach the third and fourth sides. This will keep the screen nice and tight, kind of like the head of a drum. The finished product, a fully built window screen. After what felt like an eternity of frustration and blister inducing pain, my hard work had finally paid off. The first of the screens was complete. Not only did I feel a sense of pride and accomplishment after relishing in the fruit of my labor, but I also had the confidence and hands-on experience to finish the other four screens in considerably less time. The first one took about an hour or two for me to finish, but the others maybe took 10-15 minutes each. It felt good to get them out of the way at last. All in all, do-it-yourself projects can provide great insight on things such as problem solving, patience, and craftsmanship. 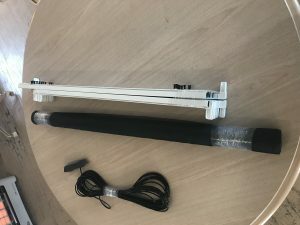 If you want to give putting a screen together a shot, consider getting your own screen kit and feel the satisfaction of putting something together with your own two hands! This article was written by Alex Norris. A lot of factors go into making the workplace a more productive environment. Keeping the office the right temperature, playing some background music or ambient noise, and creating a welcoming break room all have their impact on the mood and well-being of any worker. However, it wasn’t until just recently that I realized just how much changing the lighting in my office space could make a difference in the way I work. As somebody that deals with customers looking for new light bulbs for their homes and businesses, I can admit that I had not been using the most efficient lighting myself. It made me think about how mechanics often say that their own cars don’t run as well as the ones they fix for a living. Since the bulb over my desk was on its last limb, I figured it would be wise to finally switch to something more modern. The old bulb was a fairly standard spiral shaped compact fluorescent. While better than an incandescent bulb in terms of efficiency, it still wasn’t anything to write home about. When switching, I opted for a standard A-shaped LED. It was when I flipped the light switch back on that the figurative bulb in my head started to light up just about as bright as the LED. The first thing I noticed was the sheer amount of life the bulb gave off. The previous bulb in the office had an initial lumen rating of about 800, and given that this thing had seen better days, I’m sure that wasn’t the number you would measure from it before I changed it. The current bulb clocks in with almost twice as much light power with a staggering 1500 lumens, a major upgrade given that both lamps claim to only use 14 Watts. That brightness not only kept my workspace from feeling like a dimly illuminated crypt, but it also served almost like a wake-up call. The comparatively dim lighting always had me straining to see what was right in front of me at times. The extra brightness emitted from this lamp was just enough to help me see better and to eliminate most of the headaches I was previously suffering at work. My next realization was the contrast in color. My best guess would be that our prior bulb was in the 2700-3000K range, lending to a soft, warm atmosphere. While this color is good for spaces like restaurants and more cozy and intimate spaces, it isn’t very ideal for an office space outside of maybe a conference room, break room, or space for clients. The warmth, combined with the dimness, was enough to make my workspace a very sleepy place. The current bulb looming over my desk is more in the cooler daylight range, 5000K. The slight blue tint of the light makes it feel like I’m outside even on the cloudiest of days. Blue light like that found in natural light and LEDs is shown to have positive effects on memory, cognitive function, awareness, and overall productivity when used during the daytime hours. In some ways, getting a cooler, brighter light bulb over my workspace did for me what my daily dose of caffeine wasn’t doing: keeping me awake, aware, and ready to take on my daily tasks with extra gusto. I would highly recommend changing your lighting where you work. It might just save you on not only your electric bill but also on that potential extra shot of espresso in your morning coffee. Picking a light bulb can be tricky if you don’t know exactly what you want. There is a myriad of shapes, sizes, and colors to choose from. This video will give you a general idea of what certain color temperatures look like and how they can affect your work or home environment. Did this help you? 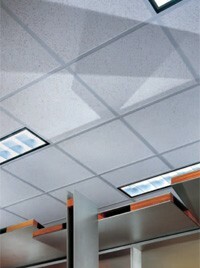 If so, feel free to check out our wide selection of lighting products and pick the lighting that best suits your needs! Still need some help? Contact us, and we’ll be happy to help you make the right decision.